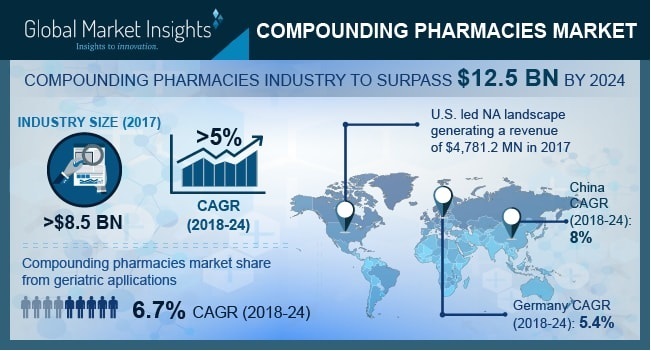 Compounding Pharmacies Market size is set to exceed USD 12.5 billion by 2024; according to a new research report by Global Market Insights. Increasing geriatric population across the globe coupled with rising prevalence of cardiovascular disease, diabetes, hypertension and respiratory disorders will serve to be a high impact rendering factor for compounding pharmacies market. According to United Nations, the geriatric population accounted for 962 million in 2017 and is expected to double by 2050. Compounded medicines are increasingly being used in geriatric population as they are often intolerant to the commercially available dosage form and need suitable alternatives. Several benefits and convenience associated with the compounded medications will impact the industry growth in forthcoming years. Compounding medicines offer reduction in number of doses by combining multi-dose prescriptions into single dose permitting patients to take one pill instead of many. For instance, medication for pediatric patients can be combined to formulate a single medication in order to avoid multiple-drugs administration issues. Furthermore, medication of specific strengths, specific ingredients and administration routes, that are commercially not available can be compounded whenever required. However, lack of skilled lab technicians and pharmacists, to prepare compounded medications in exact strength and dosage as per the patient’s requirement is a major industry restraint. Moreover, high cost of equipment required for compounding, maintenance of sterility and continuously changing regulatory guidelines will hamper the industry growth. Oral product segment dominated the market in 2017 and is forecasted to witness rapid growth over the forecast timeframe. High demand for oral liquid medications owing to associated ease of administration will boost the segment growth. Increasing preference for other oral solid dosage forms such as capsules and granules will further support the segment growth. Adult application segment accounted for the largest market share and is poised to grow at a robust growth rate over the coming years due to increasing demand of compounded drugs for treatment of cardiovascular disease that are highly prevalent among the adults. High demand for hormonal replacement therapy from adult age group will further escalate the segment growth to some extent. Hormone replacement segment will grow at a robust growth rate of 7% owing to the increasing demand for anti-ageing solutions. Heightened demand for bioidentical hormone replacement therapy for women, testosterone therapy for men and other high quality dermatological products that are primarily formulated in compounding pharmacies will further augment the segment growth. U.S. dominated the global market in 2017 and will witness robust growth over the forecast period. Several government initiatives to increase adoption of compounded medicine will fuel industry growth in U.S. Growing shortage of prescription drugs and rising prices of FDA approved drugs will escalate demand for compounded medication." China market is forecasted to grow at a robust CAGR of 8% over the coming years owing to increasing geriatric population and rapidly developing healthcare infrastructure. Growing prevalence of various age-related diseases such as arthritis, cancer, diabetes and cardiovascular diseases coupled with adverse drug reactions associated with commercially available drugs will further fuel the adoption of customized treatment driving the industry growth over the forecast period. Some of the industry players operating in global market are Fagron, PharMEDium, B. Braun, McGuff, Institutional Pharmacy Solutions, Triangle Compounding Pharmacies, Cantrell Drug Company, Wedgewood Village Pharmacy, Fresenius Kabi, Lorraine’s Company, Dougherty’s Pharmacy, Village Compounding Pharmacy, Rx3, ITC Compounding Pharmacy and Pencol Compounding Pharmacy. Industry players are taking efforts to develop newer and efficient systems for drug compounding. For instance, B. Braun, in 2017, launched the Apex Compounding System, specifically designed to address the immediate needs of critically ill patients while meeting the needs of pharmacists. Strategic expansion through mergers and acquisitions help the players to enhance and strengthen the product portfolio.